52 Quilts in 52 Weeks: What's on the Design Wall? What's on the Design Wall? I know, I promised a road trip report. I got caught up working on the next Jelly Roll Party sample, so I'll save the Saturday Stash for next Saturday! 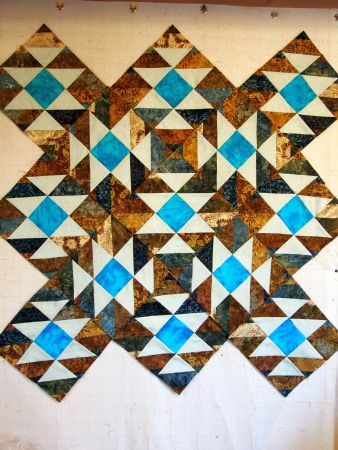 The June Jelly Roll Party quilt at Ruth's Stitchery is "At Sea," from Cozy Quilts. The Party Girls chose this one for June from a pile of patterns I brought into the shop. I love it, mostly because of the name. 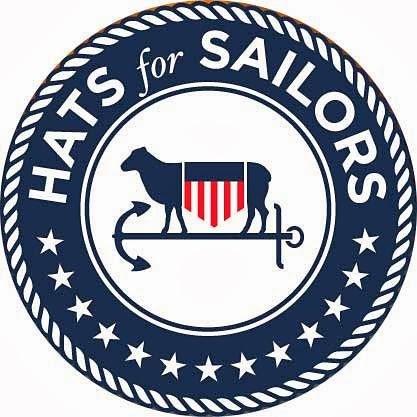 I want to have some quilts completed in case a Sailor on My Little Sailor's ship, the USS George Washington, gets a major award. It takes two weeks for mail to reach them, so I need to be ready to ship off a quilt at a moment's notice! 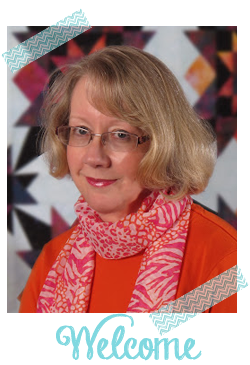 My fabrics are from Edyta Sitar's "Laundry Basket" batiks collection. The background is a very pale seafoam green. I'm waiting for the yardage from Edyta to arrive at Ruth's for the border. I did go with the muslin for the setting squares and triangles. 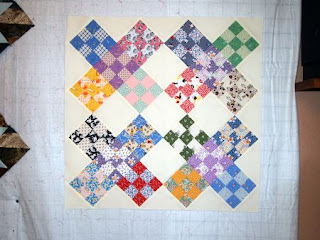 It will be fun to quilt something fancy in those blank spaces. There is barely one week left to finish my April UFO, and this is all I have done! How about you? When you have your UFO "finished" (remember, *you* decide what is finished! 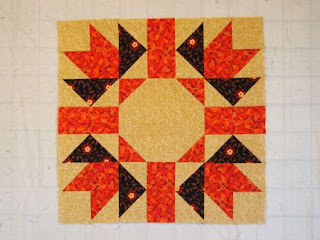 ), take a photo and email me the photo at AuntMarti at 52quilts dot com. The parade will be May 1st! Love them all but especially the hat trick in the 1930s reproduction fabric! wow I love the jellyroll fabric choices. That sailor's quilt is going to be sooooo nice. Love the colour combination for the sailor's quilt! Got my bonus project finished and hope to get to April's project this week now I'm back from holiday. I think the Hat Trick quilt looks great in 30s reproductions. Very nice! WIP Wednesday: It's a Mystery!